When Jennifer emerges on the new world of Scion, she is confronted by the same deadly enemy. Now the Kasari have sided with the planet's angel-like elite against the warrior underclass, but with the intent of ultimately ruling both. And when Jennifer is captured by the brutish Koranthians, her alien-enhanced abilities make her a crucial asset in battling the Kasari and their winged allies. Back on a divided Earth, Jennifer's brother, Mark, and Jack "the Ripper" Gregory wage their own war against the Kasari. 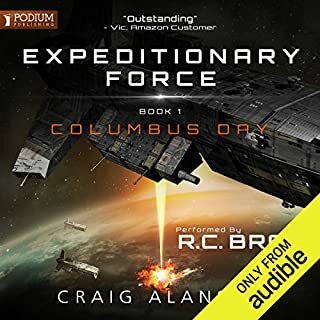 As the global government welcomes the extraterrestrials, Mark, Jack, and their rebel faction seek to use the powerful mind-altering skills gained from the Kasari's sworn enemies to repel the would-be conquerors. But faced with the might of Earth's ruling forces, has the cause already been lost? ©2016 Richard Phillips (P)2016 Brilliance Audio, Inc. I still find this series very enjoyable and exciting to listen to on a regular basis. ...and my regret is that I came across this author only in this book, without looking for the previous books in the Rho Agenda universe. That took a sizeable chunk from my fun, since there were many references and character relationships I (obviously) did not understand. However, even considering that, I was able to follow the story decently and enjoy the time spent. I'll probably re-start the series from the actual beginning, and enjoy it as it was planned to be. 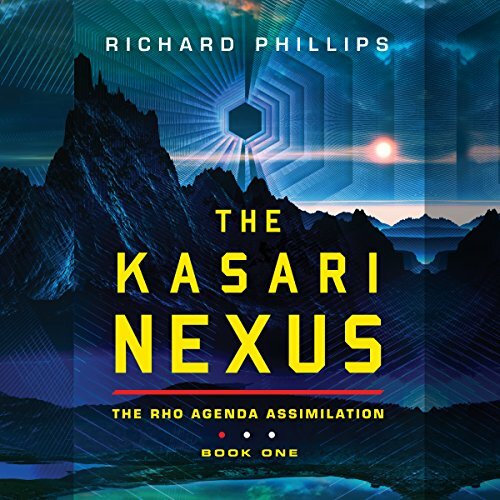 Here's the most important thing you need to know about The Kasari Nexus: it may the first entry in the Rho Agenda Assimilation trilogy, but it is NOT the first book in the Rho Agenda series. And such is The Kasari Nexus that you should NOT start the series here -- go back to The Rho Agenda. On the other hand, if you've read the Rho Agenda trilogy and the subsequent prequel trilogy Inception, if you've gotten through the first six volumes, then by all means continue the story here. 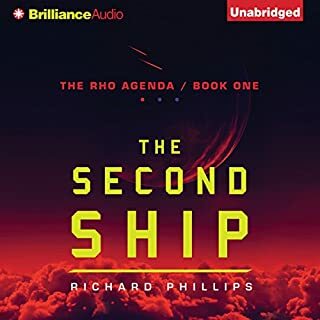 After taking time out to tell Jack Gregory's origin story in the Inception trilogy, Richard Phillips picks up the Rho Agenda tale where he left off at the end of the first trilogy -- well, not exactly right where he left off, because there is a jump forward in time, but nevertheless. Overall, if you liked The Rho Agenda (as I did), this is a worthy sequel. However -- there's often a however -- there are so many story threads that (I feel) Phillips bit off more than he should have. With plots and subplots that originated in all six of the prior entries -- not just the three teenagers of Rho or the agents closely associated with Gregory in Inception, but quite a number of other characters and storylines. There is a lot more action and violence here, which unfortunately takes the place of credible science (Phillips's forte). There is a departure from present-day/near-future Earth into outer space, although that story is the most engaging (despite being derivative). The big problem is that there are too many characters to follow, long gaps in storylines despite cliffhangers, and sometimes just long gaps without some characters. It's good, but not as good as what has come before. Have MacLeod Andrews read it. This guys voice was distracting, he couldn't adjust to play multiple roles and not even close to a female sounding voice which comprise most of the characters in this edition. Aliens with British and Scottish accents..??? This is yet proof why good narrators should never be switched in a series. This narrator was interestingly different to begin with, but before the first quarter of the story was done, it became clear the narrator realized the author wasn’t taking the material seriously, and so decided to follow suit. I cant say I blame the reader, but I do wish he could have at least done his part better. Not sure what happened between this book and the last one in the original series, but someone certainly seems to have decided that the readers have gotten dumber since then. Otherwise I am not sure why the story seems to have devolved into …this. It’s simply a mess, with a few high points in between. I won’t ruin it for anyone who hasn’t read it yet, but be warned, where the original three books had great story telling and awesome voice acting, this one has neither. This is what happens when you take a great narrator who understands the plot and story arch’s, and replace them with a cheaper substitute who is doing the work as just a “pay check”. Anyone who has listened to Joe Abercrombie’s “first law” series will immediately realize this. Like in that series, the great original narrator was replaced by a dithering half-wit whose oratory was barely understandable. At least in that series the stories did not get worse, just the narrator. In this case, both narrator and story have gotten laughable silly. I am not sure how else to explain this. The aliens have become more human and the story has become much lazier. 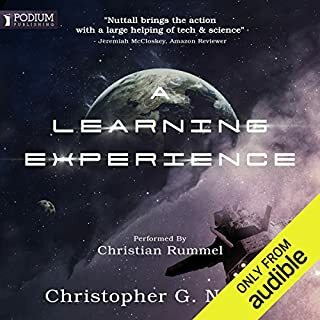 I was really hoping I would enjoy this like the first three, but this… well, there is a reason it’s less than $7 on audible. Way overpriced from my experience. First and foremost: None of the characters interested me. It might've well as been a bunch of shitting lemurs... actually I would've preferred that. The descriptive detail was nice though hollow and overused. It subsumed the entirety of the story. The universe was cool tho. Lots to chew on. Perhaps too much. My main take away is that this author has never met a person worth talking to or has and gleaned nothing of the experience. 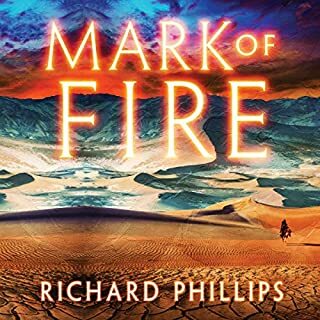 I listen to about a book a week, and have listened to all of the other Richard Phillips books in this series. For some reason they switched narrators for the Kasari Nexus and it was painful. If I wasn't 6 books in I would have not continued. They story was excellent and character growth is great but the narration was probably among the poorest in have experienced. Please bring back the old Narrator! This Narrator is no where near as good as the previous and his voices harm the integrity of the characters. This book is sure to win awards. It answers questions from book 6 and delves deeper into their world. It introduces other unexpected twists. I can't wait for the next book. Please hurry and get it out. Great continuation from the previous series. A great continuation from the previous series bringing back the characters we have seen develop from simple school kids and agents. Set seven years after the end of the last series, the world is once again headed down a dark path faited to repeat previous mistakes with only our team of hero's to stand in the way of the bad guys. If your new to the series think die hard mixed with sci-fi. For some unknown reason they changed the narrator from Macleod Andrews who was able to do amazing voice acting for all the characters as well as tell a good story. The new narrator pauses on random words and sometimes seems to get mixed up if he should be doing a character voice or his own narration voice. I don't want to hit in the new new guy to much, it's more the publishers fault. It's like watching a TV series and on season 4 you find that they have changed all the actors and not only that they are all amateurs. 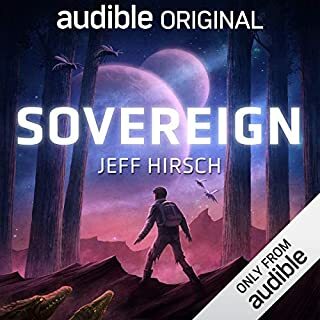 I honestly don't normally rant but this may seems such a shame for what was a great audio book series. The story is still pretty good if you can get past the all that. Edit: I would like to point out that it looks like the narrator was changed back to Macleod Andrews for the remainder of the series. Sorry, but couldn't get past the narrators over emphatic and exaggerated style of reading. 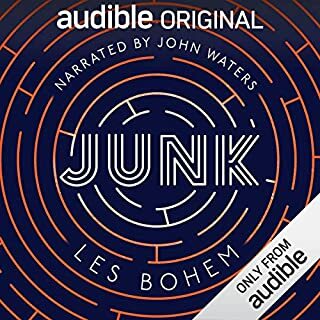 The narrators over emphatic and exaggerated style of reading completely spoiled the book for me, could only listen to a few pages before I got really annoyed. This is the fourth book in the series and it is still gaining in strength. I am just about to start the next instalment; my only complaint is I get very little sleep as I can't seem to stop listening. I am glad the narrator has remained the same throughout as it keeps the continuity going. Another great book in.the rho agenda series. I heartily recommend it with the rest of the series. The story feels like it was assuming a back story that should have been known to the reader. The book starts halfway through a story which makes it a little disjointed.